Hi folks! Hope y’all had a syndromeless Monday! As promised, this #OOTD file is all about Norwich, a beautiful and vibrant city in Norfolk, England. I moved to Norwich in September 2017 to study Medicine at the University of East Anglia. When I visited Norwich for the first time back in February 2017 for my medical school interview, I absolutely fell in love with the city as well as the university. Norwich is a place where the countryside meets the city life so you can have the best of both worlds! There are lots of local shops as well as big retailers, cafes, restaurants, museums, parks, cathedrals and so much more! So I wanted to show you guys today some of my favourite places and things to do in Norwich! I just want to start with this gorgeous snapshot I took walking through Eaton Park which is right by my house. I mean how beautiful is this view?!! I was walking home from uni one day and couldn’t help but stop for a few minutes to watch this beautiful sunset. Eaton Park is one of my favourite places as it’s just perfect for a little bike ride, a short stroll or a nice picnic on a sunny day, whichever you like the most! Moving on, I went to The Ivy Norwich last week for one of my close friend’s birthday lunch (You might know her, Jackshanaa, from my previous blog posts about Mallorca). And although it’s a bit pricey, the food was really delicious and we just fell in love with the decor. The interior of the restaurant is so gorgeous, every corner is just picture perfect! Anyways, I wasn’t very hungry that day so I only had fried halloumi with couscous and tomatoes and I just LOVED IT! Also how cute is my new Chloe bag?! It fit in very well with this colour combination so I just had to take this pic haha! If you’d like to get your hands on this bag but you think the price isn’t really worth it, click HERE for a more affordable option for a fraction of the price! I chose to wear this red v-neck sweater with my check tweed skirt that I got from Zara couple seasons ago. I think these two complement each other very well without making a very full on head-to-toe red look. One thing I love about this skirt is the red hem lining as it brings a bit more sophistication to the overall look. Instead of completing the look with a pair of stiletto heels, I chose to wear these grey suede heeled boots as I wanted to tone it down a bit for this occasion. After our lunch, we decided to have a few cocktails because why not? LOL. Day drinking at it’s best. So we went to another place called “Turtle Bay“, just down the road from The Ivy. 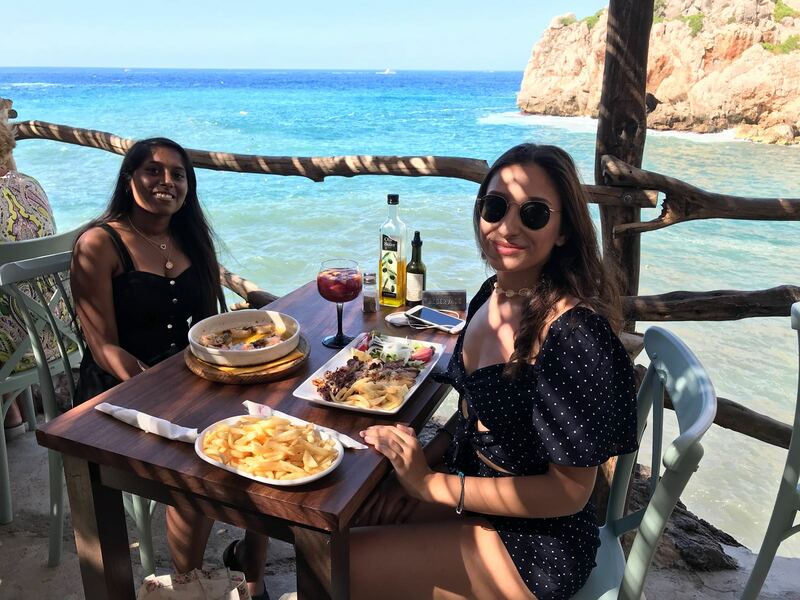 It’s famous for its incredible Caribbean cuisine but they also have delicious cocktails and an amazing 2-4-1 deal during happy hour! I had a Strawberry Daiquiri and a Jumbled Julep and they were both very nice! One last fave spot that I’d like to share with you guys is The Royal Arcade in the city centre. It’s a wonderful place to visit, packed with classic and independent boutiques and shops! There is something for everyone from retro/vintage clothing stores like “Lady B Loves” to dessert shops like “Macarons & More“. And if you’re a macaron monster like me, you’ll just love it there! I got this box of 6 macarons and seriously, they were so good! From top to bottom the flavours I chose are: raspberry, strawberry passion fruit, cappuccino, lavender, praline, pistachio. My favourite one is by far the pistachio flavoured one as I absolutely love pistachio. Not to mention that I found out it’s made from Turkish pistachio! I guess that’s why I loved it so much haha! And that brings us to the end of this #OOTD file. It’s been a long one (oops!) but hopefully you guys have enjoyed it! Let me know what you think in the comments section below! So until next time, stay inspired folks! Hello hello! Hope y’all are having an amazing week! You guys might have noticed that I’ve been gone for a while as I was moving into my new house in Norwich, trying to settle in etc. But now… I’M BACK and I’m feeling better than ever! I honestly can’t wait to show you guys my room in my new house and how I decorated it! Anyways, in today’s #OOTD file, I’d like to share with you guys 3 of my outfits from the first few weeks of uni. I also can’t wait to show you a bit of Norwich as well but for that you’ll have to wait for my next post (exciting!). Moving on, I can’t stress enough how cold it is in England, especially for me as I’m from Turkey and the weather is still quite nice and warm back there. Nonetheless, wearing sweaters, long coats and thigh-high boots after a long time reminded me of how much I missed wearing cozy outfits! I got this gorgeous beige faux fur coat from Stradivarius last year and I love the quality as well as the colour. I can easily wear it with most of my outfits. The faux fur is so soft that I honestly sometimes get distracted and randomly just start playing with it (lol!) The star piece of this outfit though, if you ask me is the checkered skort. It is extremely comfortable and gives me back to school vibes which makes it the perfect piece for this occasion! Also, I can’t help but notice that skorts have become very popular recently as you have the comfort of wearing shorts without compromising from your classy look. You’ve probably noticed so far that I have an obsession with beautiful doors as I can’t help but get pictures taken in front of them while my boyfriend just rolls his eyes the whole time (hahah!) But I mean look at these picturesque doors! For my second look, I wanted to go for something more casual so I decided to wear a baby blue jumper with this time, A BLACK SKORT! I’ve mentioned how we see skorts everywhere this season and honestly they are must-have pieces! You can wear them with a basic top or a jumper and trainers for an everyday look or combine them with a cute crop top and heels for an evening/night out look! They are so versatile and I just love them! For look #3, which is probably my favourite look, I chose to wear this sleeveless knitted dress with a white shirt underneath, all buttoned up. I think this one is very classy and chic and it has a little bit of a young feel to it. I love the way the knitted dress looks in contrast to the white shirt. You can complete the look with a pair of black ankle boots if you’re going for a more casual style. Alternatively, you can easily transform it into a formal office look with a pair of black pumps. And that concludes my 4th #OOTD file. Hope you guys have enjoyed it! Let me know in the comments below which look is your favourite one and if you’d like to see more posts like this. I’m thinking of writing a post about Norwich and also my uni, University of East Anglia (UEA) but let me know if there is anything else you’d like me to write about. Sooo until next time, stay inspired folks! Happy Monday ya’ll! I hope you’re doing well. In today’s #OOTD file, I wanted to share with you guys my beach looks from my trip to Calo des Moro, an amazing hidden heaven in Mallorca. Sooo, WELCOME TO MY FIRST EVER LOOKBOOK! Yay! Before I talk about my outfits, I’d like to tell you a bit about our tiny little adventure trying to get to Calo des Moro. 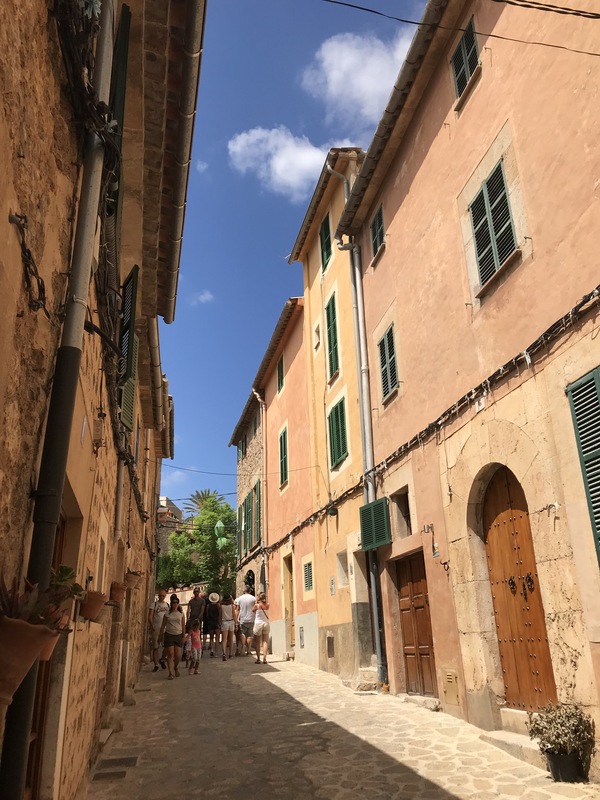 We decided to take the bus from the centre of Palma to get to Santanyi, where we’d get off at the bus stop closest to Cala des Moro. Somehow we ended up missing our stop and we’d gone too far away by the time we realised. We got off the bus at some random stop with absolutely no idea where we were and our phones were unable to give us any directions. So we just kept walking based on our instincts and pretty much got lost in the middle of nowhere. After losing all hope and thinking we got stuck there, we found a petrol station (finally!) and asked for a taxi number. 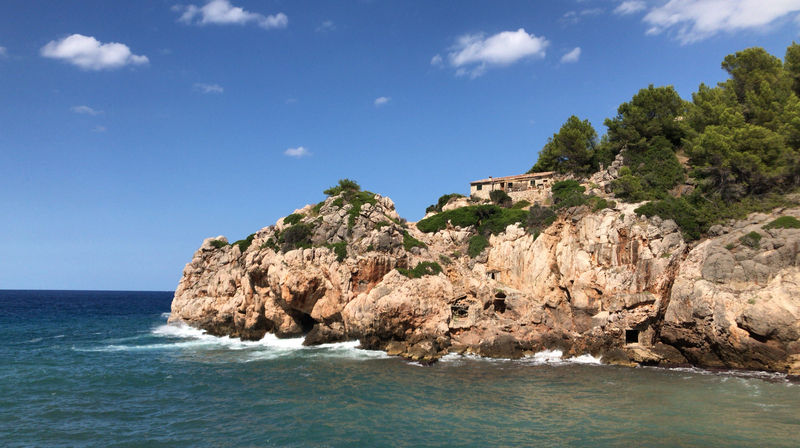 We were literally rescued by a taxi driver who picked us up from the petrol station and took us to Calo des Moro. Turns out, cars can’t go any further at some point and we had to walk down some stairs on the edge of the cliff where there were absolutely no safety precautions taken whatsoever. It was pretty scary, not to mention the fact that we were both extremely hungover! 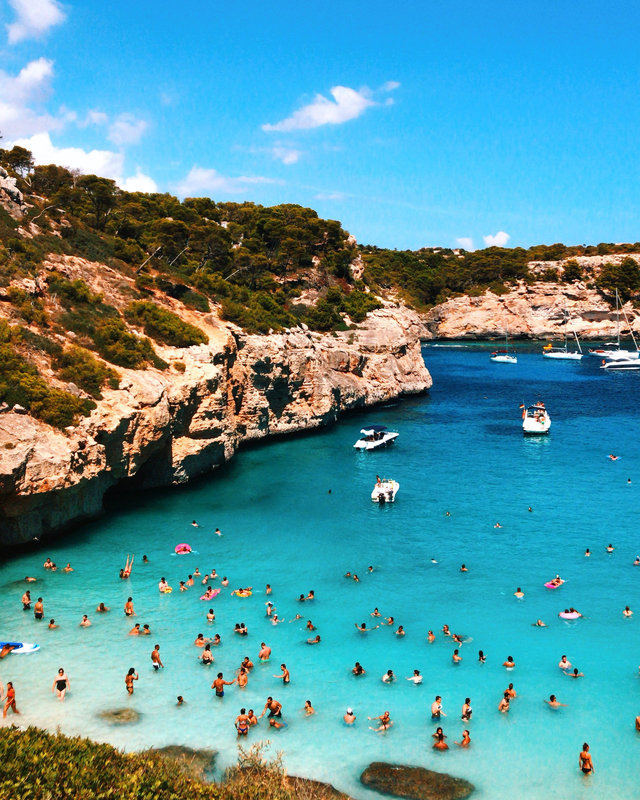 When we finally made it to Calo des Moro, we were just speechless. It was the most incredible beach I’ve ever seen. I mean just look at the pictures below, wow! It was definitely worth all the hassle. Anyways, that’s enough information about our scary adventure, let’s get to the lookbook! I chose this white maxi dress for my first look of the day. It feels so summery and the colour looks really good with a tan. I love the way it hugs my body in all the right places and the open back looks absolutely gorgeous. I paired this dress with my beige sun hat that I love wearing on holiday as it’s such a must-have piece! I chose to wear this outfit on my way to the beach but this dress can also be worn to dinner on a summer evening when paired with ankle strap heels or heeled mules. My first swimwear choice of the day was this red striped bikini set. I think I first saw it in Calzedonia but I thought it was overpriced. When I saw the exact same bikini on the Pretty Little Thing website at a more reasonable price, I immediately added it to my bag. The top looks beautiful on as it accentuates the abs. The frill detail adds a bit of sophistication while still keeping it young and fresh. The bottom is quite comfortable as it’s easily adjustable. Also did I mention red is one of my favorite colours? It really is the perfect bikini and I’m in love! Right now both the top and the bottom are on sale as well, so I suggest you don’t miss this opportunity! I’m not the one to love the colour black but this piece actually makes me wanna add more black pieces to my closet. What I love about it is that it looks like a beautiful bikini from the back but it’s actually a one-shoulder swimsuit that shows just the right amount of skin. I think this is actually one of my favourite swimsuits as I feel so comfortable swimming in it. In fact, that’s probably one of the most important things that I look for in a swimsuit. I don’t know about you but comfort is a priority for me, especially at the beach. Why give up your comfort just to be stylish when you can have both, right? If you like this swimsuit, it’s actually on sale right now in Oysho so go grab one before the sale ends! So this one actually has been a popular piece for the past two years and you’ve probably seen it on someone on Instagram. I think it’s sort of become a classic as the flower details at the back look gorgeous! It is really comfortable as well and surprisingly, although it’s white it makes you look quite fit! I got this swimsuit from a local boutique in Turkey although you can find it on La Reveche’s website as well, the original brand that first started selling it. I love wearing this swimsuit but I’ve got so many pictures in it so I decided to sell mine (size 6) on Depop to clear up some space for new stuff! If you’d like to check it out (and also some other items that I’m selling, all in great condition), click HERE. I can’t talk about beachwear and not mention my beach bag, right? I got this straw tote from Benetton at the start of the season and it’s been my go-to beach bag ever since! This beautiful shade of green, combined with wooden handles, makes this bag look really chic. It looks quite small from the outside, so you might think it would be really difficult to fit all your stuff into it. However, it’s much larger on the inside and I can fit two large beach towels and all my other beach essentials into it! How amazing is that? Sadly though this exact bag is no longer available but I found a very similar one HERE. And that brings us to the end of my first lookbook! I hope you all enjoyed it and I’d be very glad to hear what you think about it. I really can’t choose as I love all of them but I think my favourite one would be either look #2 or #3, so let me know which look is your favourite! And until next time, stay inspired folks! TGIF, fashion lovers! It’s the end of another week as summer comes to an end which makes me kinda sad. But I’m excited to go back to England to start the new academic year and see my friends after a very long break. Anyways! Today’s blog post, which marks as the second #OOTD file, is brought to you from Valldemossa, Mallorca! We took the bus from our hotel in Puerto Portals to Valldemossa and before we even got there, we were greeted by a gorgeous scenery! As the bus was moving really fast, I couldn’t get a high quality picture but if I could, it would look something like the one below! I really liked my outfit that I wore in Valldemossa. This tie front playsuit is very comfy and looks like a co-ord although it’s actually a one-piece! 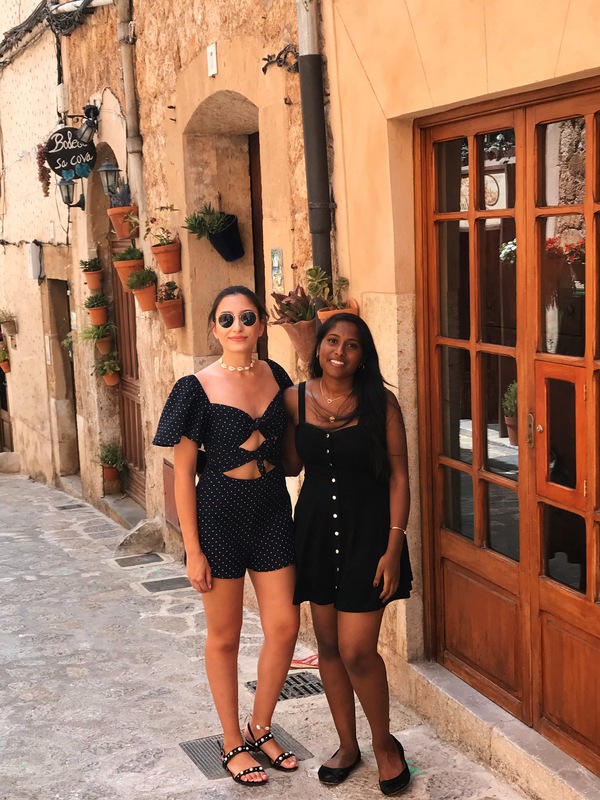 I paired this playsuit with my black pearl sandals that I had purchased from a local boutique in Turkey, very similar to these Steve Madden ones. By the way, if you like my sea shell choker, a very popular piece of accessory this season, you can get a similar one HERE. I love how this choker complements almost all of my summer outfits! 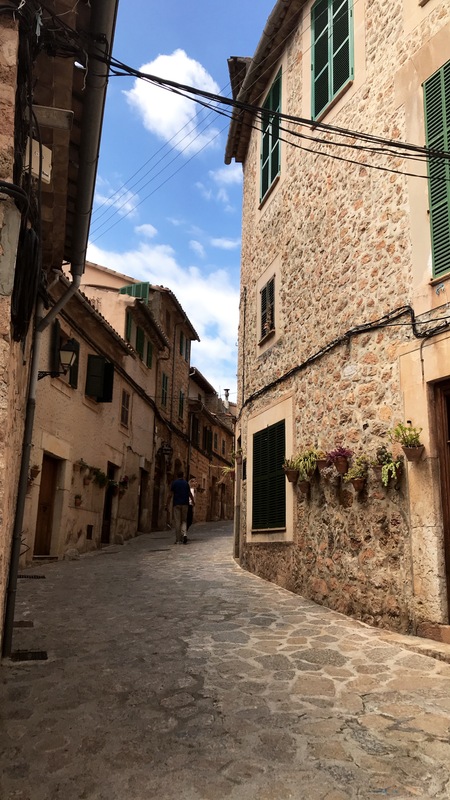 Moving on, when we finally got to Valldemossa, we were mesmerised by the beauty of this little town. There were local boutiques, ice cream shops, cute little souvenir stores literally everywhere! 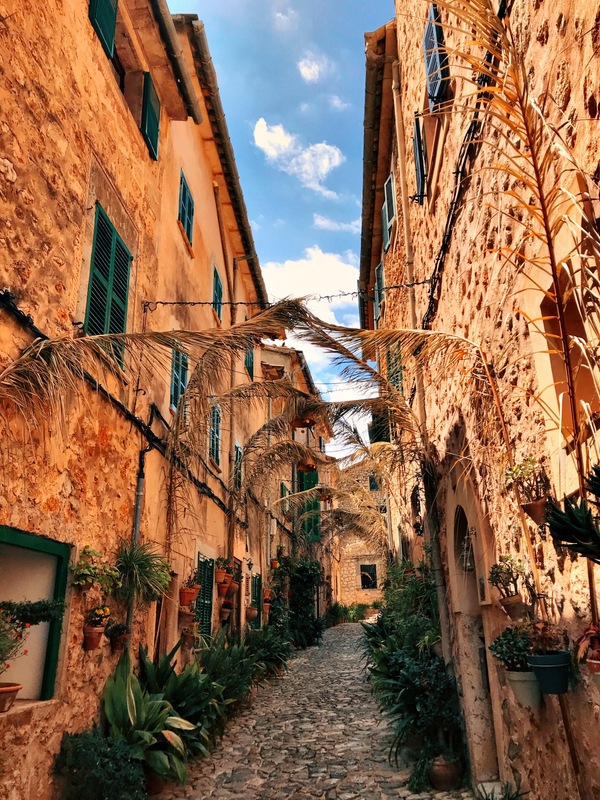 The most iconic thing in Valldemossa is the flower pots on every stone wall which makes the perfect photo opportunity! We couldn’t help but take photos in front of every beautiful door as well! We walked around in this little town and realised although most alleys seem to look alike at first, there is something about each alley that makes them unique yet incredibly gorgeous. 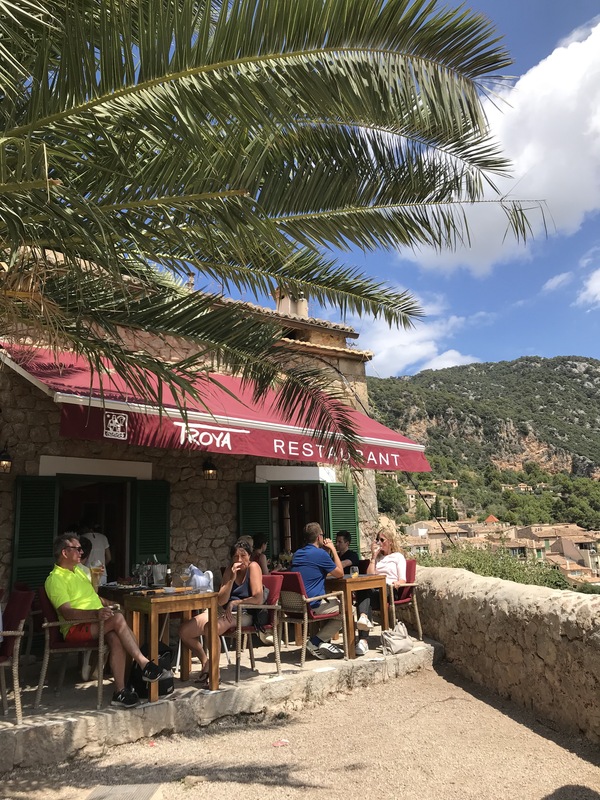 After a couple hours well spent exploring Valldemossa we took the bus to Deia, only half an hour from Valldemossa, to have lunch at this amazing seafood restaurant called “Ca’s Patro March” in Cala Deia. It’s situated just by the sea with an INCREDIBLE view. 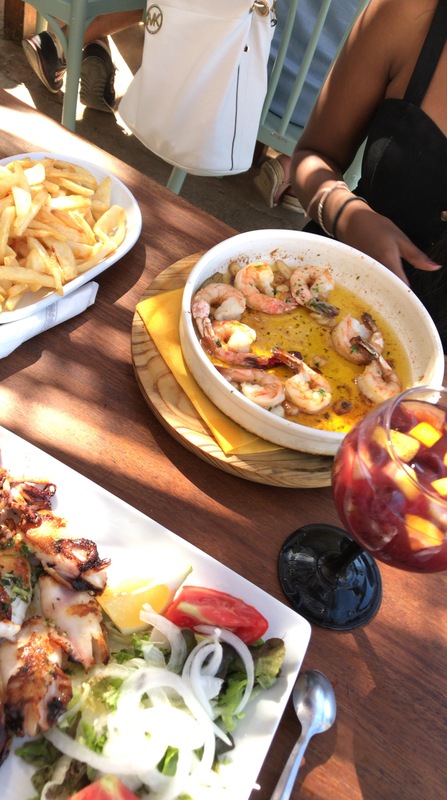 It’s a quite popular restaurant though, so I suggest making a reservation beforehand to avoid the queue and if you do, definitely ask for a table by the sea! It is quite a long walk from the centre of Deia where the bus stop is, which is why I suggest you arrange a taxi if you’re not driving there. I had the most amazing sangria at this restaurant! Our food was delicious too, I definitely recommend their calamaris, yumm! Sooo, that was our second day in Mallorca in a nutshell. We might have gone out clubbing later that night followed by an awful hangover the next day (lol!) 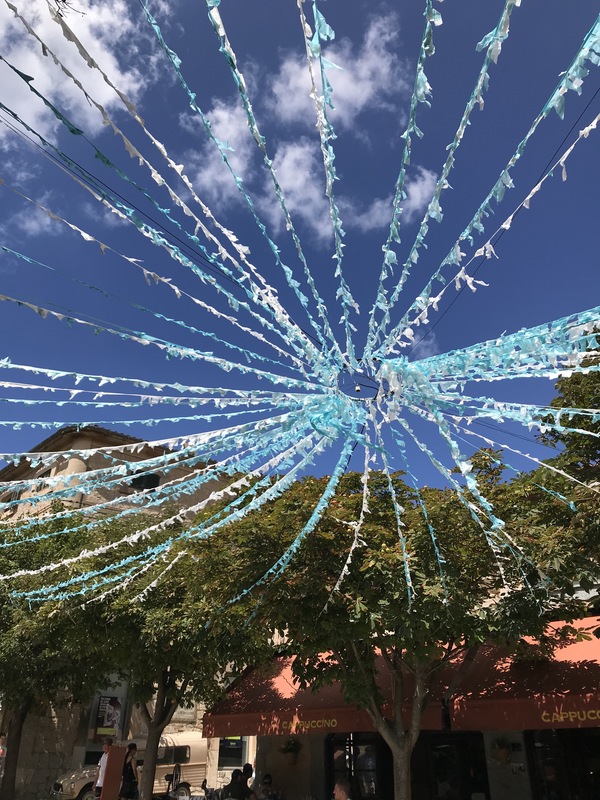 when we took a trip to ……… CALO DES MORO! 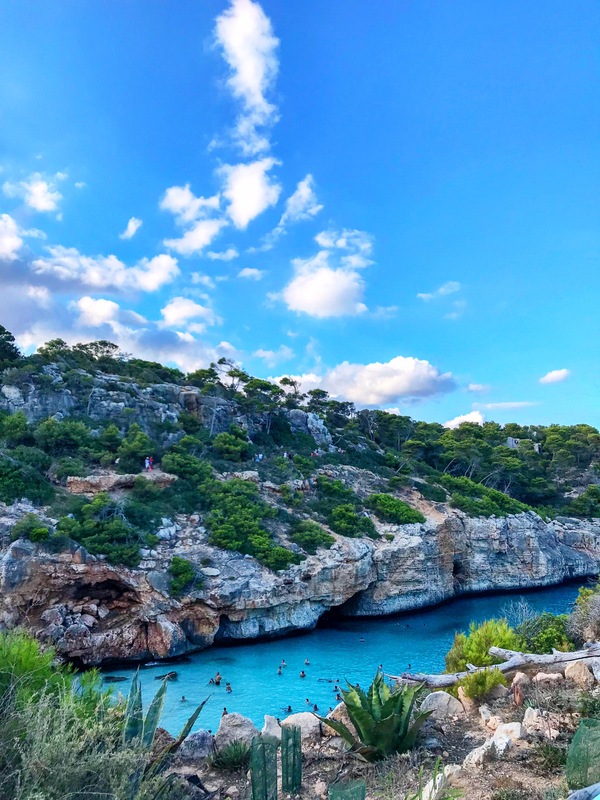 My next post will be on our long journey to Santanyi where we got lost in the middle of nowhere trying to get to one of the best secluded beaches in Mallorca, where the water is literally the bluest of blues! So until my next post, have an amazing weekend folks! Happy Thursday, fashion lovers! 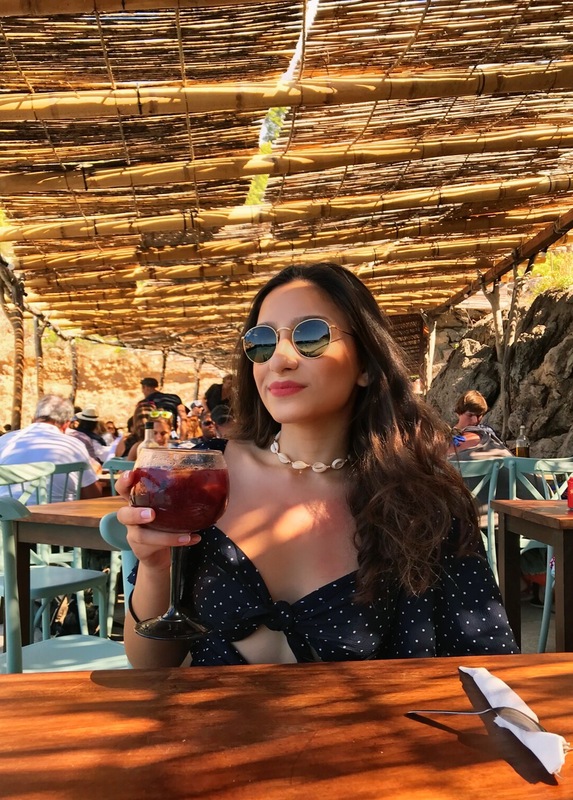 In my first #OOTD file today, I wanted to share with you my travel diary from Palma de Mallorca, Spain! I arrived in the afternoon after a long journey from Istanbul to meet my lovely friend, Jackshanaa (on the right in the photo below) at our hotel in Puerto Portals. 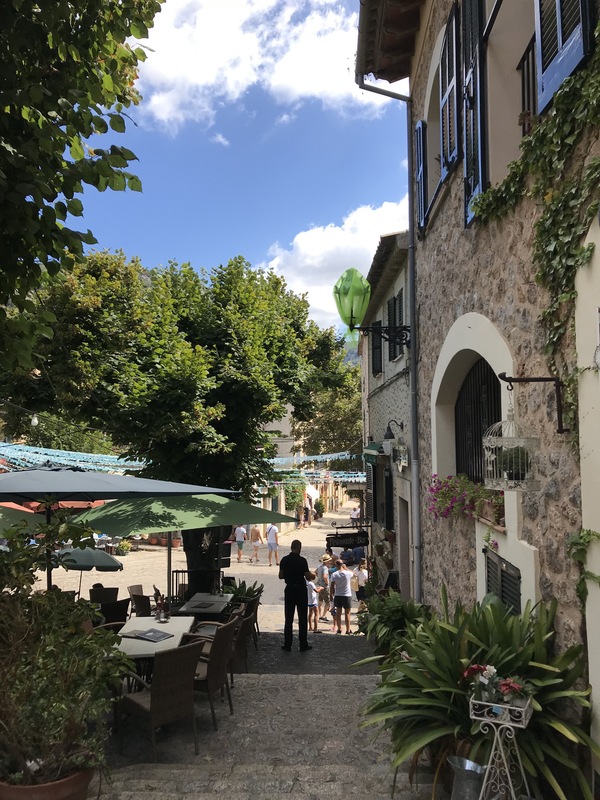 We decided to explore the area around the hotel that day, so we walked down the road to Portals Nous where we came across really nice shops, cafes and restaurants! We also saw a cute orange wall with a window just near the port and couldn’t help but have an impromptu photoshoot there lol! My outfit of the day was this tie front top paired with my old Zara shorts. I especially really like the top as it has this tropical vibe to it and since I was on holiday, it was just the perfect top! By the way, if you like my shorts I found very similar ones on Asos. My beautiful blush pink Pauls Boutique clutch bag was a gift from my best friend for my birthday last year and it’s been my go-to bag ever since! It goes perfectly with literally every outfit! Mine is sadly no longer available though, but I found a very similar one HERE and it’s 50% off at the moment so I’d say don’t miss it! After our little photoshoot by the orange wall, we had a much needed late lunch/early dinner at a slightly fancy restaurant called “Wellies” by the port and their sirloin steak in Cafe de Paris sauce was INCREDIBLE, I highly recommend! After our meal, we took a bus to the centre of Palma to watch the sunset, followed by a stroll by the sea. We barely made it in time to catch the sunset but it was definitely worth seeing the sky change into a million colours! It was just WOW! Sooo, that’s it. The first ever #OOTD file! I hope you’ve enjoyed it. My second post will be brought to you soon (an exciting one really!). 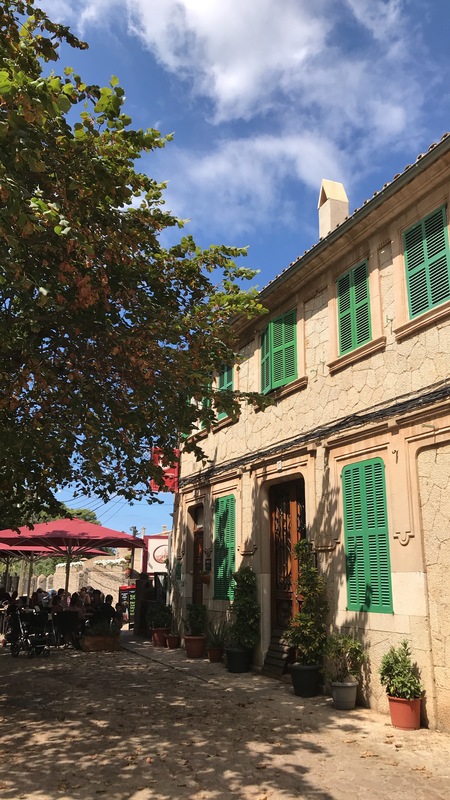 It will be about our second day in Mallorca exploring the beautiful town of Valldemossa that I fell in love with, also our lunch at the most AMAZING location in Cala Deia! So until then, stay inspired folks! Welcome to The #OOTD Files! I’ve been wanting to start a blog for a while now and I finally got the confidence and the creative mindset to start The #OOTD Files! Yay! I’ll be sharing my fave outfits here as well as my travel diaries and suggestions. 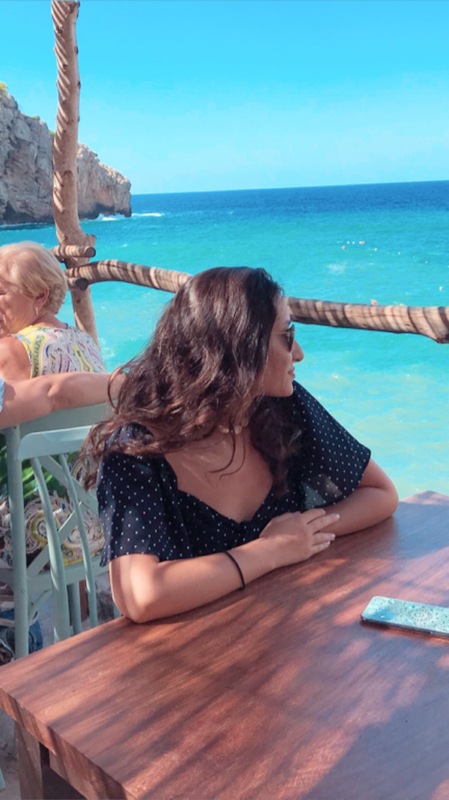 For those who are wondering who I am, just a little bit of information about me: I’m a 19-year-old gal born in Istanbul, Turkey living in Norwich, England. I can describe myself as a fashion and travel enthusiast although this is only just a hobby of mine as I aspire to become a doctor. I’m currently a 2nd year medical student at the University of East Anglia in Norwich and I’m looking forward to sharing my life here on “The #OOTD Files” mostly through my sense of fashion hoping I can inspire others! Hope you enjoy what you see here and if you do, give me a follow on Instagram, @edasansel ! Just a little quote below that I live by. Until my next post, stay inspired folks!